It used to be, just a few short weeks ago, that the major emphasis at FamilySearch.org was the records it digitizes and makes available to its users. You would navigate to the website, and the very first thing you’d see would be the search box to take you into the millions and millions of images available to the genealogist there. Now the emphasis is on sharing. 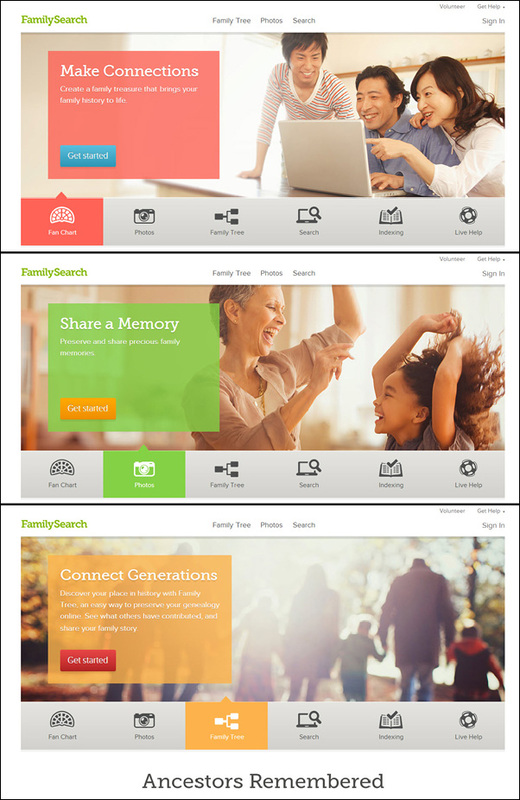 There are six rotating images at the landing page for the website and the first three, in order, are for making connections with an online fan chart, sharing memories by uploading and sharing photographs, and connecting generations by creating an online family tree. Oh, the records are still there — thank heavens! — but the focus has shifted to the user and sharing of information among users. In plain English, by using the website and uploading anything — a photo, a story, any comments you share about an ancestor or about your research — you are giving FamilySearch an unlimited right to use what you’ve uploaded. It’s a license, meaning you do keep your own copyright in your own work, but it’s a license that allows FamilySearch to do just about everything that copyright law says you’re the only one who can do: copy it, display it, create derivative works from it, and modify it. If you choose to upload something, you must understand that you are agreeing to allow it to be downloaded and used by everyone else who uses the website for their own personal noncommercial research, to be revised and included in the FamilySearch Wiki, to be used in training materials and similar purposes. Your grant of permission is perpetual — meaning forever — and it’s unrestricted. You can’t come back later and say you didn’t mean it; you can’t object when someone else starts using that particular picture you uploaded of Great Aunt Tizzy; and you’re never going to be paid for anything you wrote and uploaded that ends up being the featured section of the FamilySearch Wiki. If that purpose doesn’t sit well with you — if you have qualms about seeing your words used by others or about other people downloading your family photos — don’t upload to FamilySearch. It’s as simple as that. Bottom line: share with care, and if you’re a professional you can use the images for client reports and illustrations in blogs and lectures. Thanks Judy for writing this up! You always make these things seem so much clearer. I had been contemplating uploading a tree at Family Search but will be discussing this information with my family, first. I wouldn’t hesitate for a moment working on a family tree (by itself) for prior generations, Concetta. I would definitely not include anything on a living person — not a single thing — without that person’s consent. More important, though, is the very last clause: “…modifying your contributed data.” Uh, uh! If you want to change my stuff, you ask me first. I’m perfectly willing to allow corrections of facts, but if I have the copyright you don’t get the license to make any changes to it without further negotiations. Separately, why do all the sites right these terms so that we have to ask specifically about use by professionals? Is nobody capable of using plain English and spelling this out ahead of time? With all due respect, this is one of the primary reasons people don’t like lawyers! I hate to bring up a sensitive topic, but some of my clients have expressed concern over submitting the names of ancestors on FamilySearch because of the church’s history of baptizing posthumously. It’s your choice whether to participate or not, Toni, but while the experience with the trees may be frustrating, it doesn’t pose the same issues as actually uploading a document or photograph. I forgot to say I no longer send anyone to familysearch and it’s gone pretty far down on my search list because of the new emphasis on sharing and because the original documents are now hosted by ancestry.com. If I’m going to end up at ancestry -and pay there to see that document- I may as well start at ancestry.com and save myself a few clicks. Ditto for fold3 and what ever new site they’ve signed up with today. I’ll still be paying at each site. Maybe their next new thing will be a subscription site for access to their partner sites. Can you even guess what that would cost! For the record, only a small number of the documents are at Ancestry. The vast majority at FamilySearch are available right there. With so many options available now for individuals to put their information on the web without having to learn ‘geek stuff’- and just about all genealogy software programs include an automatic website generation program (simple-minded, true, but effective)- and “blog for free” sites are all over the web- and my web host even offers one of the free genealogy collaboration software apps in their application suite— with all that available, it’s hard to see why anyone would need to surrender their control to sites like Family Search. I urge everyone to look around a bit before assuming that the only way to achieve Internet collaboration & publication- “sharing”- of your research is through sites like Family Search. If the primary focus is sharing, and the individual doesn’t mind sharing without restrictions, then FamilySearch works as well as any site, Jim — and will probably reach more people than posting anywhere else. So this really is a “whatever floats your boat” situation. If folks don’t like the terms here, another site is definitely in order. But if they don’t mind the terms and want to reach lots of cousins, FamilySearch makes as much sense as any place does. Thanks so much for going through this and for thinking about all the possibilities, including the family researcher, the professional genealogist, lecturer, and blogger. Well thought out as usual. Thanks, Ginger! Sure was glad to get the clarification from FamilySearch. Hey, I’m Family search neutral- neither “fer” nor “agin”. But it is clear from your responders, above, that they do give some folks ‘heartburn’, and the point I was making was that it is not necessary to go against your reservations & join to gain all the benefits of web sharing. There have been a lot of recent technical advances in web access that have not been fully digested by the genealogy community, many of which make ‘portal’ sites like Family Search less dominant. And, the ubiquity of the search engine has made the physical site location of information much less important these days. Spend some time around younger users of the Internet- they type ‘Ebenezer Scrooge genealogy’ into a search bar on their smart phone, and click on the interesting sites listed- they don’t think- gosh, better go to Famous Genealogy site and search for Ebenezer’s family..
You’re absolutely right about the technological changes, Jim. What makes FamilySearch so important to me is the records, and I’m not sure they’re going to show up in that ‘Ebenezer Scrooge genealogy’ search. Records: That is a keyword in your statement. When someone adds or detracts to a record already posted with “records” and proof of documentation, new records and documentation should be posted along with the addition or the detraction to prove the “new” information. I am really upset with FamilySearch now…I loved Ancestry.com…sorry to see the Church sell it. It is very hard to do the family temple names …thinking you are finished with a family…and find SOMEONE has added more names to the “list” with NO documentation.! ! ! Make sure you express your concerns to FamilySearch. There’s a feedback button there. 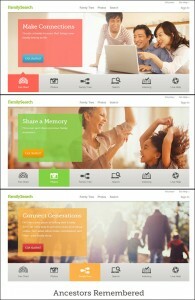 I really like the idea of FamilySearch Family Tree because of the collaboration that will be possible. Right now, someone can just copy info from my tree to their tree on my Ancestry.com and Rootsweb WorldConnect trees and not ever contact me. At least with FamilySearch, I will be able to set a “watch” on my ancestor and collaborate with the people who make changes. I am curious as to what will happen on FamilySearch when two cousins disagree about great-great-great-grandpa’s death date. Will they just keep changing it back and forth, since anyone can change an individual ancestor’s information at FamilySearch? As for photos, though, I’m more cautious about using FamilySearch. Before you posted this, I had already decided not to upload any photos of any individuals who are living. Now that you have highlighted the terms, I’m definitely not posting any living photos. I post photos of living people on my Ancestry.com tree because no one from the general public can view them. From the most recent Legacy Family Tree webinar I watched about FamilySearch Family Tree, the photos of living people are available to the general public (though their info, such as birth dates/places, is not public). Is that your understanding too? As far as I know, you’re right, Jennifer. NO information about living people (though I believe you can see yourself, your spouse and your children). Wow. This is exactly the reason why I will not ever post a tree on Ancestry.com, and now add Familysearch to that list. Once you post information, it belongs to them. It’s really too bad, because the whole culture of genealogy is/should be about sharing, and I am more reluctant to do so as time is passing. I hadn’t read FamilySearch’s terms yet and am grateful to read their terms and your explanations of them. Great clarification. I haven’t read Ancestry’s, either (and don’t have a tree there) but I wonder how different their terms are to FamilySearch’s terms. This was a very helpful post. Thank you, Judy. Ancestry is on my list for the future, Nancy! FamilySearch has stated that its purpose in writing the broad language is to secure for itself and its users the right to reuse the materials. Family Tree is a collaborative effort which I use all the time and am grateful that we can finally make the needed changes. You will still want to use a personal database, for example,I use Legacy. We are not encouraged to add photos or stories of living people, which means I won’t be adding my grandparents family photos from their golden wedding celebration, although it’s been more than fifty years ago, because there are still living people in the photos. The idea of sharing photos and stories is so we can see and read the stories of our deceased ancestors. You will only see living people on Family Tree for three reasons: 1. If you are a member of the Church of Jesus Christ of Latter-day Saints, your name will automatically show up even the first time you go to your tree. You will also see your spouse, children, parents and grandparents. (I am not sure about great grandparents, grandchildren, etc.) 2. You will see the records of any living individuals that you have added personally. Say Aunt Tilly is still living and you added her to the tree. You will see her record, but no one else will see her information. 3. Some people are not as careful as they should be, so on occasion living people are listed as deceased. This can be taken care of by Family Search Support and the living person can be taken off. As for the Temple Ordinances, church members are supposed to get permission from the closest living relative for anyone born in the last 110 years. Some people disregard this rule, but FamilySearch will not hesitate to ban people who do not follow the rules from using their sight. I will not hesitate to share the photos and stories of my deceased ancestors because my goal is not to make money off from them. I have already found stories and pictures that I had never seen before. I hope this post makes sense. If not I will blame it on my Cub Scouts who had a good case of Summeritis today. The post makes perfect sense and offers a different point of view, for which I’m grateful. As usual, Judy, your explanation is crystal clear. I have seen other blogs on this topic, but you are so thorough that I feel fully informed. I’m glad you asked them about blogs, in case I every participate in their sharing. Not that I’m a sharer in this sense. I build and run an Ancestry family tree for most of my relatives, and it’s a private tree. Part of it extends to living people — which was useful in our family reunion last year. My family members all wanted a private tree, so we have one. It’s enough “public sharing” for me that anything I write on my blog posts can apparently be googled until the end of time. So I write nothing that I wouldn’t say to a crowd on the town green. It’s amazing to see how we are gradually negotiating copyrights and privacy issues on the internet. It seems that a fluid transition is in progress, and I wonder what it will be like 10 years from now. You are soooooooo right that concepts of rights and privacy are changing daily because of the Internet. I also wonder what the future holds… next week, not just next decade! While this blog and comments centered on familysearch.org I would bet money that, while I haven’t waded through the legalese, other sites like ancestry.com or myheritage.com have the same terms. They’re on the list for future review, Linda. Thanks a million for this link Judy. Most of my ancestors are gone and the living don’t want me to put any of their names up on FamiySearch. Since the provenance of most historical images cannot be determined then those conditions-of-use make sense as an aid to sharing. It would be impossible for contributors to assert copyright on most of them, and similarly with FS. The sharing is somewhat thwarted by those same conditions prohibiting display on another Web site, and I have been informed that this includes non-profit blogs too. How many people have bothered to ask that before writing a blog-post that uses one of the FS images? It’s been a show-stopped for me! What you’re being told is contrary to what FamilySearch told me: using images on a blog for illustrative purposes is acceptable.